The Celestron 93544 is 3-in-1 is the ultimate multipurpose device for the outdoorsman .This rugged 3-in-1 tool features a hand warmer, a multi-mode flashlight, and a portable power supply for smartphones and personal electronics. 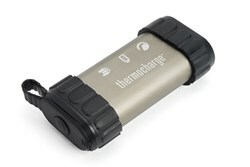 The dual mode hand warmer provides continuous heat for up to 12 hours. Choose to heat just one side when FireCel Plus is in a pocket, or both sides to warm hands. The 5200 mAh rechargeable lithium ion battery delivers 2 full charges to most smartphones and MP3 players, and also charges USB-powered cameras. 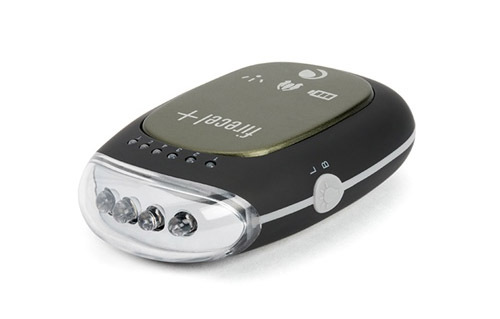 An integrated flashlight features both red and white LEDs and five modes, including SOS for unexpected emergencies. 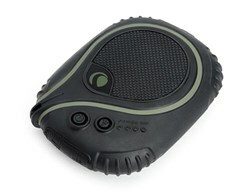 The red LEDs are ideal for stargazing or anytime you need to preserve your night vision. FireCel Plus’ high quality aluminum shell is rugged enough for outdoor use, and compact enough to fit in your pack, pocket or glove compartment. Never leave home without the 3-in-1 FireCel Plus. The Celestron Elements FireCel+ has many exciting features for users of all types. You can extend the lifetime of your Celestron Elements FireCel+ with the purchase of a FactoryOutletStore Factory Protection Plan. 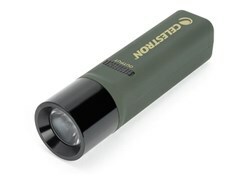 See the Celestron Elements FireCel+ product video and gallery images above for more details. FactoryOutletStore stocks a full line of accessories like 2-in-1 Device, 3-in-1 Device, and 8x21 Binocular for the Celestron Elements FireCel+. 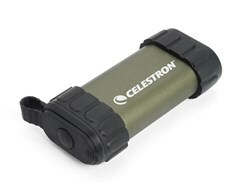 The Celestron Elements FireCel+ is sold as a Brand New Unopened Item.